The state’s competition watchdog has opted against a full probe. IRELAND’S COMPETITION WATCHDOG will not launch a full investigation into Heineken Ireland’s exclusive deals with sellers despite citing fears that the drinks giant could be unfairly shutting rivals out. Several complaints have been made to the Competition and Consumer Protection Commission (CCPC) over the past two years regarding the behaviour of Heineken Ireland. The company is a one of the biggest players in the Irish beer and cider market, owning brands including Murphy’s stout, Foster’s lager, Tiger beer and the recently-launched cider Orchard Thieves. The complainants, who are not identified, have said that the company has struck deals with bars and restaurants that effectively shut out competing brands. 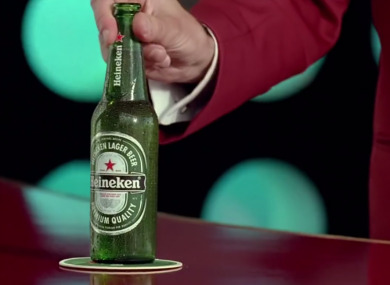 It is claimed that Heineken offers outlets both money and free products in an effort to keep out rivals. The complainants claim that this is an abuse of the company’s market dominance that makes it impossible for new drinks to get a foothold in the market. After receiving several complaints, the CCPC wrote to Heineken in August 2015, saying that it wanted information about any steps that the company may be taking to discourage pub and restaurant owners from stocking rival products. According to documents released to Fora under Freedom of Information laws, Heineken told the CCPC in December 2015 that it did have a number of exclusive agreements in place. However, the letter did not give any detail on these arrangements, such as how many had been agreed or what conditions they included. In March 2016, the CCPC wrote to Heineken saying it wasn’t proceeding with a formal investigation. However, after receiving further complaints, the competition watchdog again wrote to the drinks company in October 2017 and warned that “the CCPC is concerned that HIL (Heineken Ireland) alleged practises may result in anti-competitive effects”. It said these effects include “the foreclosure of HIL’s competitors from the on-trade beer and cider sectors” in breach of competition laws. Asked by Fora why it is not going ahead with a full investigation, the CCPC said that not all exclusive arrangements breach competition law. For example, if a drinks company made an exclusive agreement with a very small number of pubs, it would be unlikely to stifle the market. “The CCPC does have some concerns about the potential impact of some arrangements between Heineken and on-trade outlets,” the watchdog said. The company’s exclusive deals are not the only Heineken Ireland practises that have raised concerns. Last year it was found that the company was mislabelling some of its products. It was revealed that some drinks, such as such as Foster’s, were sold as being ‘locally produced’ beers called Blasket Blonde in a small number of pubs. Heineken faced no sanctions as a result of the incident, although the CCPC and the Food Safety Authority of Ireland said they would continue to monitor the situation. Heineken Ireland told Fora that it does not comment on its relationships with customers. Email “Heineken Ireland won't face investigation despite fears it shuts rivals out of pubs”. Feedback on “Heineken Ireland won't face investigation despite fears it shuts rivals out of pubs”.